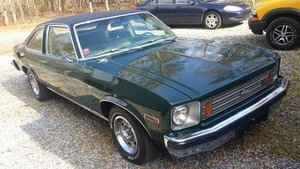 This amazing 1974 Chevy Nova is in great shape and with a big block 454 under the hood, it is a fun drive also. It has vintage AC, power steering, power disc brakes, a MONSTER Kenwood stereo, and aftermarket gauges. The transmission is a Turbo 400 mated to a 3.73 positraction rear end. This car came from Arizona that had a nice solid body even before it was stripped down and given a really nice paint job. When you take off the 454 V8 will put you back in the seat and put a smile on your face.